These are our classic breakfast buns and the buns for which our truck is named. 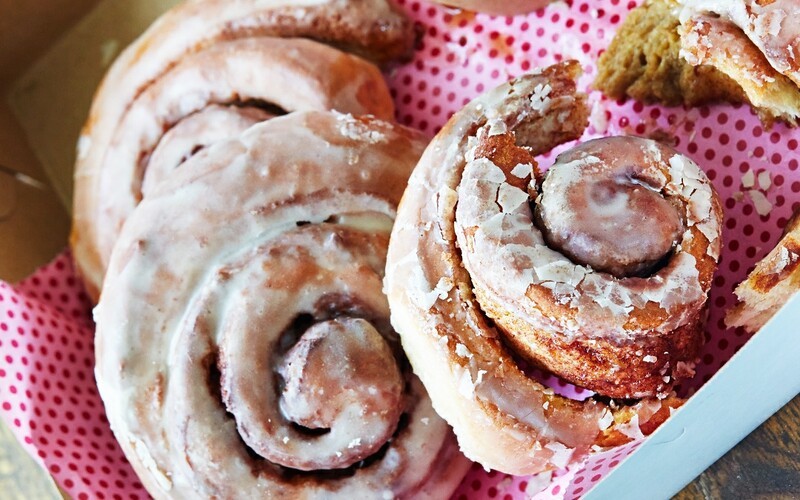 Cinnamon buns have a spiral, snail-shell shape to them, which is why some people call them cinnamon snails. People ask us so frequently about the truck’s name. The truth is, we used to make these pastries for the farmers’ market before we started the truck, and we thought the name was cute. That’s pretty much the whole story . . . But then a Sasquatch snatched up all the puppies, and we had to save the day by riding on a giant cybernetic snail, dousing the bad-guy Sasquatch with cinnamon until he stopped being mean and did a lot of giggling, and we all ate cupcakes, and yayyyy! Line a baking sheet with parchment paper and lightly oil the paper with vegetable oil. On a floured work surface, roll the dough out into a rectangle ½ inch thick by 16 inches wide by 20 inches long. Brush the surface of the rectangle with the melted margarine. Sprinkle the evaporated cane juice and cinnamon evenly over the surface of the rectangle. Starting at the edge closest to you, evenly roll up the rectangle into a cylinder approximately 3½ inches in diameter. Cut the roll crosswise into ¾-inch-thick slices. Place the slices at least 1½ inches apart on the baking sheet and allow to proof in a warm, humid environment for 15 to 30 minutes, until they have puffed to almost twice their original height. Bake the proofed buns for 15 to 18 minutes, until lightly golden brown and no longer doughy to the touch. While still warm, brush the buns with 3 to 4 tablespoons of glaze apiece. Cinnamon snails are best if served warm and fresh from the oven, but they can be gently brought back to life if reheated in a toaster oven or in a covered skillet over low heat. In a large pot over low heat, warm the soy milk and canola oil to 95°F. Pour the warmed soy milk and oil into a large bowl. Sprinkle on the yeast, and sprinkle the evaporated cane juice on top of the yeast. Allow the yeast to activate for 5 minutes, until it foams up. Add the flour and knead together on a floured work surface for about 90 seconds to form a smooth dough. Transfer the dough onto a floured work surface, and for 3 minutes knead in the salt, baking powder, and baking soda. This is the white glaze we use on our Vanilla-Bourbon Crème Brûlée Donuts, Cinnamon Snails, plain glazed donuts, and so many other yummy treats. This is a nice, simple recipe that you can tweak into any kooky glaze idea you fancy by adding flavors to it, or by changing the liquid (try replacing the soy milk with an equal amount of apple cider, flavorful tea, coconut milk, or whatever you love the most). In the bowl of a stand mixer fitted with the whisk attachment, combine the soy milk, vanilla, and powdered sugar and whisk until smooth. Use immediately, or store in an airtight container in the refrigerator for up to 3 weeks. Before using, gently warm in a double boiler to just above room temperature. Reprinted from Street Vegan: Recipes and Dispatches from the Cinnamon Snail Food Truck. Copyright © 2015 by Adam Sobel. Photos by Kate Lewis. Property of Clarkson Potter, an imprint of Penguin Random House.